Differential invariants [1,4,5,13,21] provide induction principles for differential equations. They can be understood as the differential analogue of induction techniques but for differential equations rather than for discrete systems . Discrete induction is used to prove a property of a loop by proving that the invariant is true initially and then that it is preserved every time the loop body executes once. Similarly, a differential invariant is proved to hold always after a differential equation by proving that it holds initially and by proving that it is preserved in the direction of the dynamics of the differential equation. 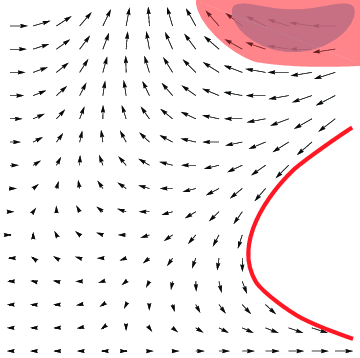 Differential invariants can prove properties of differential equations without having to solve the equations, which makes them computationally attractive. Differential invariants [1,4] define an induction principle for differential equations [11,21]. They make it possible to prove properties of differential equations without having to solve the equations. Differential invariants are formulas that remain true along the dynamics of the hybrid system and its differential equations. The central property of differential invariants for verification purposes is that they replace infeasible or impossible reachability analysis with feasible symbolic computation. 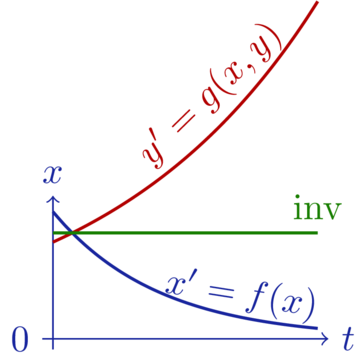 Differential invariants are computationally attractive concepts, because their inductive conditions are formed by differentials or Lie derivatives, giving decidable first-order real arithmetic. Differential invariants have been studied in a number of results [1,13,14,11,18,20,7,21]. Together with the other invariant principles for differential equations explained below, they make differential equation invariants decidable . Differential invariants (and their companions below) have been implemented in the KeYmaera theorem prover, its successor KeYmaera X, in Isabelle/HOL, and the Coq proof assistant. The dual verification technique of differential variants can be used to prove liveness and progress properties of differential equations without having to solve them. Differential variants  are implemented in KeYmaera. Differential cuts [1,4,13,21] allow the use of lemmas that have been proved for differential equations. Differential cuts work as follows. 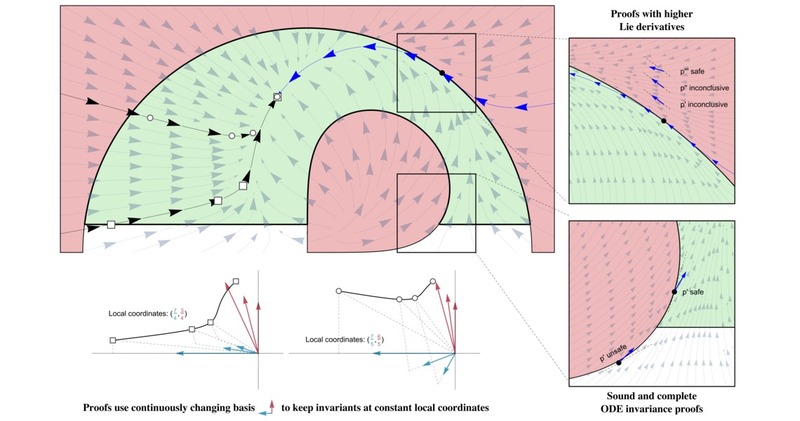 They first prove that a differential equation never leaves region C and then restrict the dynamics of the system to C. Restricting the dynamics of a system to a subregion C usually changes the behavior of the system, except that the first proof already showed a lemma that the system cannot leave region C anyhow, so that the restriction of the dynamics to C turns out to be a pseudo-restriction that does not change the actual dynamics even if it changes the description. The no differential cut elimination theorem  has been proved, which implies that differential cuts cannot be eliminated but fundamentally add to the deductive power. Sometimes you crucially need to exploit differential cuts to be able to verify. Ghost variables (or auxiliary variables) are extra variables that remember intermediate states, which can be useful for proving properties of conventional discrete programs. Differential ghosts [13,21] are the differential counterpart. What differential ghosts do is that they introduce extra variables into extra dimensions of the system, which can further evolve according to extra differential equations that are made up solely for the purposes of the proof. By crucially exploiting differential ghosts, it has been shown that invariance properties of differential equations are decidable  just by conducting a corresponding proof/disproof from these axiomatic reasoning principles for differential equations. We prove the completeness of an axiomatization for differential equation invariants. First, differential equation axioms in differential dynamic logic are shown to be complete for all algebraic invariants. The proof exploits differential ghosts, which introduce additional variables that can be chosen to evolve freely along new differential equations. Cleverly chosen differential ghosts are the proof-theoretical counterpart of dark matter. They create new hypothetical state, whose relationship to the original state variables satisfies invariants that did not exist before. The reflection of these new invariants in the original system enables its analysis. Extending the axiomatization with existence and uniqueness axioms makes it complete for all local progress properties, and further extension with a real induction axiom makes it complete for all real arithmetic invariants. This yields a parsimonious axiomatization, which serves as the logical foundation for reasoning about invariants of differential equations. Moreover, the results are purely axiomatic, and so the axiomatization is suitable for sound implementation in foundational theorem provers. A generalization of differential invariants to higher-order derivatives, called differential radical invariants, gives a decision procedure for algebraic invariants of algebraic differential equations. Differential radical invariants decide equational invariants p=0 for polynomials p. Differential radical invariants  are implemented in KeYmaera. Differential radical invariants also give rise to an efficient procedure for generating algebraic invariants for algebraic differential equations based on fast symbolic linear algebra . The canonical reference on differential invariants is the article in the Journal of Logic and Computation  that appeared in 2008. Differential invariants were later used for a fixpoint procedure that computes differential invariants and verifies some interesting hybrid systems automatically , which appeared at CAV'08  and in a special issue of FMSD for selected CAV papers . An elegant axiomatic formulation of differential invariants, differential cuts, and differential ghosts has been reported at CADE'15  and JAR , which was subsequently exploited for a differential equation axiomatization at LICS'18 . Also see publications on differential invariants and the publication reading guide. Andrew Sogokon, Khalil Ghorbal, Paul B. Jackson and André Platzer. A method for invariant generation for polynomial continuous systems. Khalil Ghorbal, Andrew Sogokon, and André Platzer. A hierarchy of proof rules for checking differential invariance of algebraic sets. Invariance of conjunctions of polynomial equalities for algebraic differential equations. Khalil Ghorbal and André Platzer. Characterizing algebraic invariants by differential radical invariants. A differential operator approach to equational differential invariants. The structure of differential invariants and differential cut elimination. School of Computer Science, Carnegie Mellon University, CMU-CS-11-144, November 2011. Logic and compositional verification of hybrid systems. Formal verification of curved flight collision avoidance maneuvers: A case study. This paper was awarded the FM Best Paper Award. Automated Theorem Proving for Hybrid Systems. PhD Thesis, Department of Computing Science, University of Oldenburg, 2008. ACM Doctoral Dissertation Honorable Mention Award in 2009. Extended version appeared as book Logical Analysis of Hybrid Systems: Proving Theorems for Complex Dynamics, Springer, 2010. School of Computer Science, Carnegie Mellon University, CMU-CS-08-103, Feb, 2008. For full details, please see my List of Publications.